Cleaning the toilet is not everybody’s most favorite activity. Nevertheless, it is one of those necessary chores that you need to do in order to maintain a clean, healthy and hygienic bathroom. Armed with your willpower and the Best Toilet Cleaning Brush, this task can become a lot easier and faster. A toilet brush that doesn’t clean your toilet bowl thoroughly is a waste of time and money. Over time, you will see that the bowl has changed color and your toilet doesn’t look as clean as you want it to be. 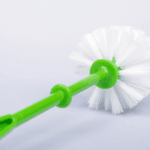 In this article, we managed to compile a list of the top 10 best-selling toilet cleaning brushes that can play an important role in leaving your bathroom squeaky clean. The first product on our list is rather innovative. It is a comprehensive cleaning system that cleans, removes stains, and disinfects your toilet bowl in one go. The system comes preloaded with Clorox cleaner, a potent cleaner that removes 99% of the bacteria and germs in your toilet. It leaves your toilet squeaky clean and guarantees that it will look as good as new for a long period of time. The sponges are designed to clean the hard to reach places under the rim where the bacteria might live and grow. They are also disposable so you can get rid of them to make sure that you have gotten rid of the bacteria for good. It comes with a storage caddy where you can store the wand and the refill heads, making sure that you don’t have a germs-packed brush stored in your bathroom. The cleaning heads are very easy to replace. All you have to do is to push the head onto the wand until it clicks and you will be good to go. When you are done, toss the head away and have the clean bathroom you’ve always dreamt of. Comprehensive cleaning system with a storage caddy and refill heads. Sponges packed with Clorox to disinfect and remove stains. Sponges are designed to clean hard to reach places. Disposable head to get rid of the germs and bacteria. The simplehuman toilet brush is designed to withstand vigorous use. The stainless steel wand and the hard bristles of the brush are going to last for long, guaranteeing that your toilet will be as clean as possible. The brush’s innovative crescent shape is designed to scrub and clean all the hidden corners and angles that other brushes can’t reach. The outer bristles are very stiff to remove all the stains and grime that provide a good home for the harmful bacteria. The brush comes with a unique magnetic grip collar that allows you to carry it without dripping. The slim dome-shaped cover will keep your brush discretely hidden when it is not in use. Thanks to this brush you will not have any stains or discoloration in your toilet bowl. The head can be easily removed and replaced to keep your toilet clean and hygienic. Reaches corners and angles for thorough cleaning. Stainless steel wand for vigorous use. This is definitely one of the best toilet bowl brushes on the market. It is durable, practical, and designed to remove all the tough stains. The brush is tapered to reach all the angles and corners easily. The tough bristles will remove the stains easily cutting down the cleaning time. The handle of this brush features an oval cross-section that provides a good grip and prevents the brush from spinning in your head. It has a flexible neck that enables it to get under the rim and remove all the stains. 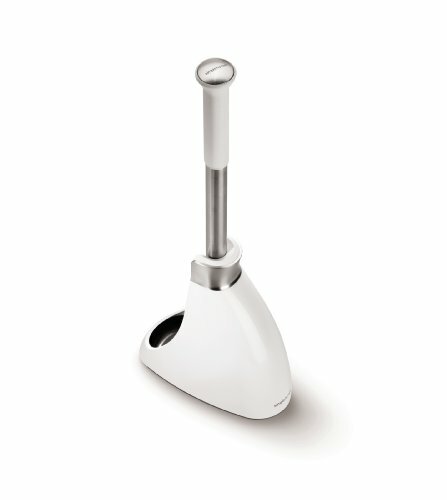 The canister automatically opens when you lift the toilet and it stores the brush discretely when you are not using it. 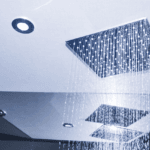 It has a drip tray with ventilation slots that allow the water to evaporate easily. The air circulation prevents mildew growth to keep your bathroom hygienic and clean. The brush features 2 kinds of bristles. The stiff ones are designed to scrub and remove tough stains from the rim while the softer fibers will keep your bowl clean and shiny. The shape of the brush minimizes the amount of water picked up by the brush when you are done with the cleaning. The brushes are replaceable and come in different colors to suit the décor of your bathroom. It keeps your hand away from the mess guaranteeing that your toilet bowl will be spotless. Tapered brush with stiff and soft fibers. Canister automatically opens when the brush is lifted up. Drip tray with ventilation slots to evaporate the water. Prevents the growth of mildew. Flexible neck to reach hard and hidden places. This product is designed to help you deal with a lot of cleaning up and maintenance chores in the bathroom. It is a budget-friendly choice because you get a toilet brush and a plunger for an affordable price. The brush is designed to remove all the bacteria and dirt that is naturally found in the toilet even if you flush it after every use. 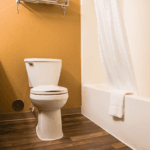 The plunger can help you deal with unexpected clogs that affect the water drainage system in your bathroom. You will have one safe caddy with an anti-skid bottom to keep it stable on the floor. The round bowl brush features tough bristles that can deal with any spots or stains. It covers a large cleaning surface so you can clean your toilet bowl fast. The turbo plunger features a strong handle that provides a good grip and more control. Having two of the most used tools stored in one caddy keeps your bathroom clean and tidy. This set is made of durable plastic and will help you finish your cleaning chores in a few minutes. A toilet cleaning brush and plunger in one set. Canister has an anti-skid bottom. Round brush to cover a large cleaning area. 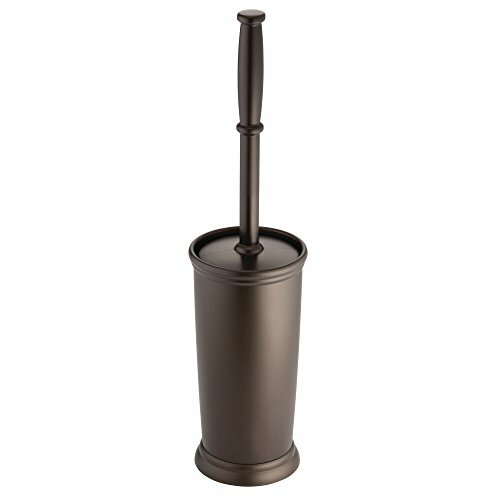 Plunger has a durable handle that provides a good grip. 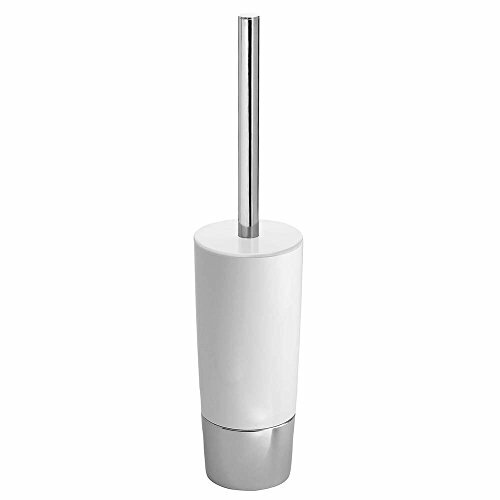 This is a great choice if you are looking for a modern toilet brush cleaner. The holder hides the brush completely when not in use. Yet, it allows you to use it easily when you need to clean your toilet bowl. 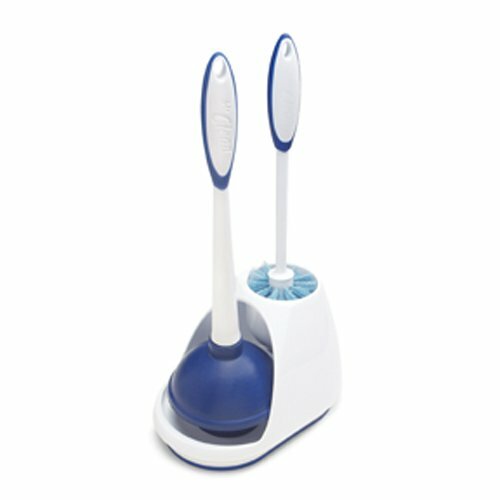 The brush features strong plastic bristles that will clean all the spots and stains. They can also reach the hidden areas and tough corners to keep your toilet bacteria-free. The brush head is replaceable and you can toss it away after a while to make sure that your bathroom is clean and hygienic. This brush and its holder occupy minimum space on your bathroom floor. So it is a perfect choice for smaller bathrooms or people who hate clutter. The chrome accents add a stylish finish to this tool, making it a great option for elegant people who look for something special. This product is highly durable. The wand is strong and provides a good grip while the brush will scrub all the filth away. It comes in 2 different colors and is highly affordable. Durable brush with stiff bristles. 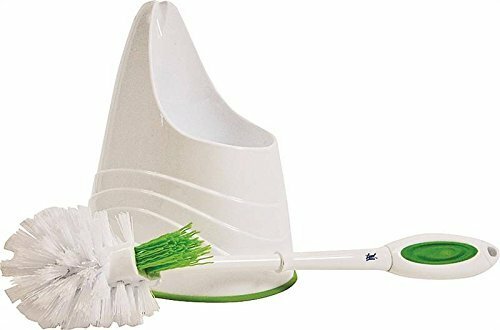 If you are looking for an affordable and durable bathroom toilet bowl brush, then you definitely need to check this one out. 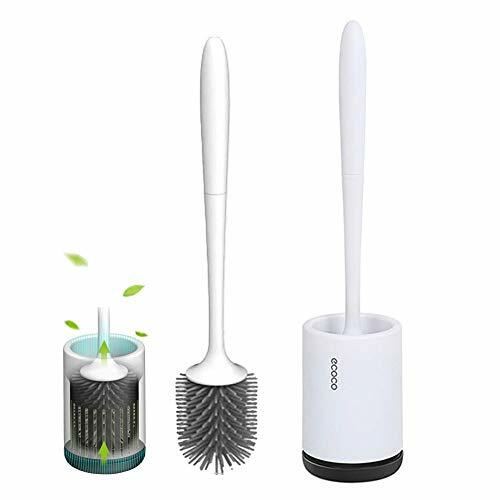 This wonderful toilet brush is designed to remove all the dirt and bacteria in your toilet bowl to keep your bathroom clean and fresh. 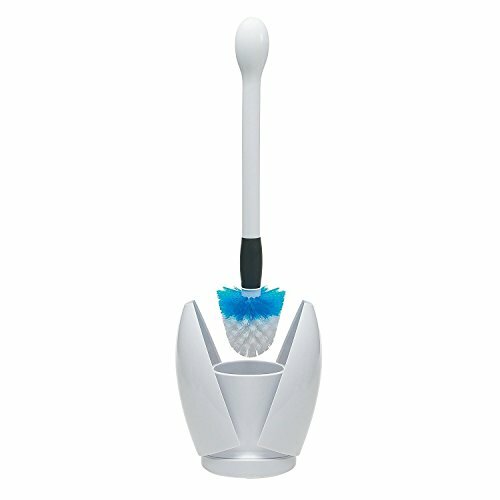 The brush features an antimicrobial layer that deals with the bacteria and germs in your toilet to minimize bad odor. This antimicrobial agent is fitted right into the fibers of the bristles to disinfect your toilet while removing the stains and spots. 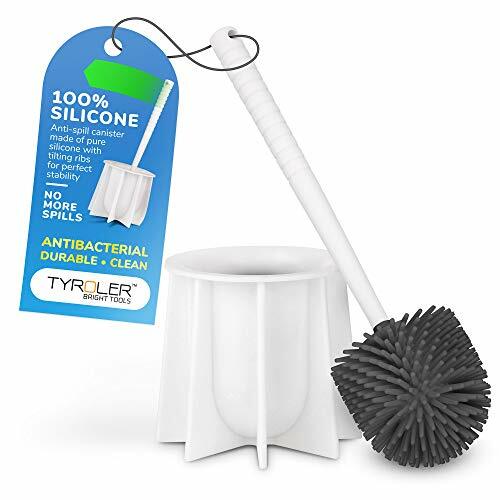 Although this product is highly affordable, it does a great job at removing the tough and stubborn stains that other brushes might not remove. It also prevents the growth of mildew, bacteria, and mold that cause the unpleasant nasty smell in the bathroom. The fiber extension lasts for a very long time. 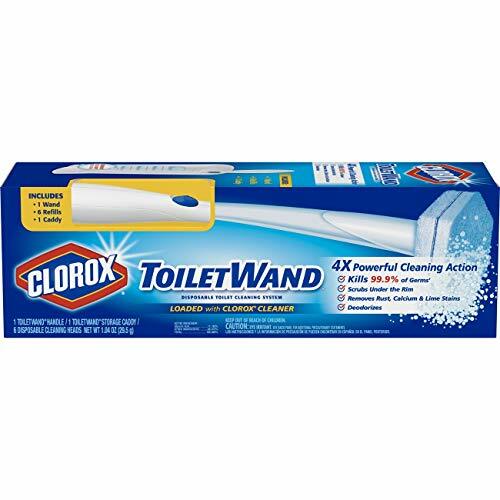 The wand is durable and provides a good grip that enables you to clean your toilet bowl thoroughly. When you buy this toilet brush you know that it is a great value for the money. The bristles don’t fall off easily no matter how hard you scrub, keeping your bathroom shiny and dirt-free. Affordable brush with rough bristles. Antimicrobial layer that gets rid of bacteria and germs. Prevents the growth of mildew and mold and helps get rid of the nasty odor. This toilet brush delivers what it promises: a bacteria-free toilet bowl. The brush is made of silicone. Unlike plastic bristles, dirt and filth can’t stick to this toilet so it stays clean and ready for use. The silicone prevents the growth of bacteria. It is sturdy enough to remove all the stains and grime and keeps your toilet clean and spot-free. This brush is a great value for the money because silicone doesn’t wear or change shape so you can use it every single day. As a matter of fact, you don’t have to press in order to remove the stains or spots. With minimum effort, you will be able to get the best cleaning result. It reduces the cleaning time while removing all the filth that causes stains and bad odor in your bathroom. It is also eco-friendly because it lasts for a very long time. You can also fill the canister with your favorite detergent to double the cleaning effect. This antibacterial brush can be cleaned with any detergent and will look as good as new. The canister’s minimal design complements the look of any bathroom. It features ribs that prevent it from tipping over and spilling. If it accidentally falls, the ribs will push the canister back like a spring. Silicone brush that doesn’t catch the grime or filth. Very durable brush and canister. Canister springs back into place if it accidentally falls. It is affordable, durable, and discrete. There is actually nothing that we don’t like about this toilet brush. It comes in a stylish minimalist canister that is strong enough to withstand everyday use. The brush features strong and sturdy bristles that are designed to keep your toilet shiny and clean. When not in use, you can toss it in the canister. Store it next to the toilet for a clutter-free bathroom. 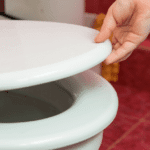 The non-skid non-slip foam base will keep the toilet holder in place until needed. The brush has a round disc that protects your hand from splashes. This guarantees that your hand will be safe away from all the mess while you are scrubbing your toilet clean. This is a great product for compact bathrooms and works well with any décor. The brush is made of durable shatter-resistant plastic and is guaranteed to last for a very long time. It is a great value for the money and will also protect the floor of your bathroom from scratches thanks to the foam base. Simple holder that occupies minimal space. Anti-skid and anti-slip foam base. Round disc that protects your hand from splashes. This is a great product for industrial, commercial, and residential bathrooms. You receive a pack of 12 brushes for an affordable price. Thanks to its simple design, you will be able to install one in every bathroom. The brush has strong bristles that are made of durable plastic fibers. These will remove all the tough stains while preventing the growth of bacteria and germs. Using this brush in your bathroom will prevent the nasty odor and keep your toilet smelling fresh. You can use it with any cleaning detergent for best results that will last for long. The wand has a comfortable grip that allows you to reach all the tough corners. The brush comes with a holder that is made of polypropylene plastic and keeps the brush standing upright. The holder allows for easy access. It enables you to use the brush every time you use the toilet to keep it clean and shiny. The holder is sturdy and will stay stable on the floor. Affordable and durable brush and holder. Prevents the growth of bacteria and removes all the tough stains. Sturdy holder that keeps the brush upright for easy access. Suitable for commercial and industrial buildings. The last product on our list is easy to clean, germ-free, and is going to last for a very long time. It is made of thermoplastic rubber. 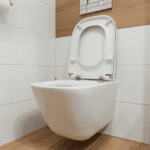 It doesn’t scratch your toilet bowl, yet it removes all the stubborn stains and spots. This brush is not going to change shape with everyday use which makes it a great value for the money. The rubber bristles bend perfectly to reach all the difficult corners and hidden places. It is designed for deep cleaning without having to scratch your toilet. You don’t need to press for effective cleaning. This is a great choice for people who want to get done with their cleaning chores as quickly as possible. The non-slip handle design provides a comfortable grip that will allow you to use your brush effortlessly. The brush comes with a convenient holder that features a hollow suspension design. It maximizes the airflow inside the holder allowing the brush to dry faster. This brush prevents the growth of bacteria and mold. The holder can be wall mounted to keep your bathroom floor clutter-free. It also guarantees that the brush will not accidentally fall. It keeps your brush hidden discretely and provides easy access. Brush bristles are made of thermoplastic rubber. Effective and fast cleaning results. Comfortable grip for more control. Holder is designed to maximize the airflow for faster drying. When you are shopping for a toilet cleaning brush, you need to make sure that it can reach all the hidden and hard-to-reach places. The filth and dirt in your toilet can accumulate away from your eyes providing a great environment for the growth of bacteria and germs. Make sure that the bristles are designed to clean and remove all the tough stains. The shape of the brush can be round to cover a large cleaning area or tapered to reach all the corners. You also need to make sure that the handle is durable and provides a good grip for more control. Disinfecting your toilet can be done while scrubbing it. You can pick a toilet brush that features an antimicrobial layer or has a disinfectant that can kill the germs or bacteria. 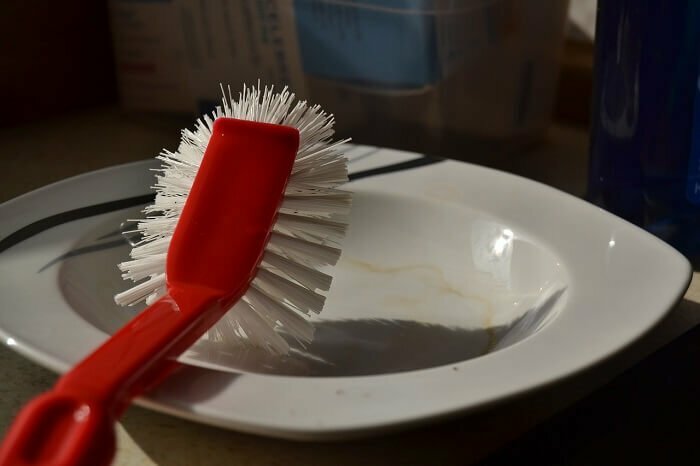 Your brush bristles should be strong enough to handle cleaning detergents that you can use to make sure that your toilet bowl is squeaky clean. Plastic fibers are very strong and durable. You need to make sure that your brush bristles are strong enough to withstand everyday use. You can also pick silicone or rubber brushes. These are not as stiff but will do a great job at removing the stains and spots in your toilet. After using the toilet brush, you need to clean it thoroughly to make sure that it is safe for use. You can use a disinfectant, bleach or a cleaning detergent to remove the bacteria after cleaning your toilet bowl. Some brushes come with removable brushes that can be replaced after a while. This means that you will have to endure extra costs but will guarantee that your toilet brush will always be clean and ready. The holder is very important because it keeps your brush discrete and ready whenever you need it. Make sure that your holder is designed to keep your brush upright for easy access. It should also be stable to minimize accidents. A storing holder or caddy will keep your brush away from eyes and can be kept in a closet or a cabinet when you don’t need it. Some holders feature holes or slots that maximize the air flow, allowing your brush to dry faster. You can also pick a holder that holds your brush away from the base to prevent the growth of bacteria. You should also think about the look of the holder, as some designs can complement the look of your bathroom. Buying the Best Toilet Cleaning Brush will significantly decrease the time you spend cleaning your toilet bowl. A good brush will scrub and clean every dirt particle that can promote the growth of nasty bacteria. 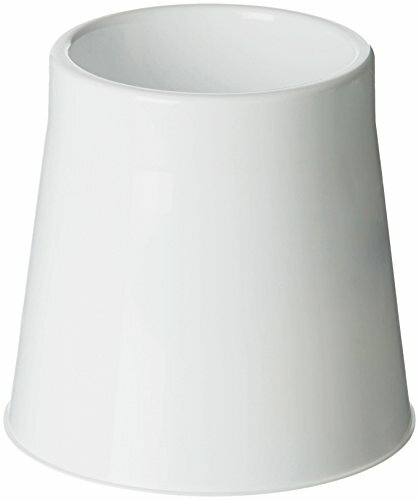 It can reach all the hidden places and discrete areas under the rim to make sure that your toilet is squeaky clean. Using a sturdy and reliable brush will keep your toilet germs-free and will prevent the spread of the bad odor. Make sure that you buy a good brush with a sturdy holder that will keep it ready for easy access.